As I have reported since 2005, the Bush administration has endangered the American public by welcoming college students from Saudi Arabia to study at US universities. It's bad enough that these foreign students are taking slots that could go to worthy young citizens, but the policy is clearly a national security threat. 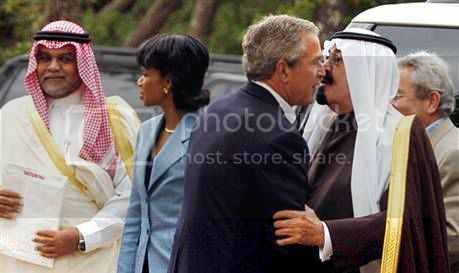 Now, President Bush and his Saudi pals want more. Al-JOUF, 10 April 2008 – US Ambassador Ford Fraker said in Sakaka that his country aims to double the number of student visas issued to Saudis. Muslim students have already been involved in terror plots, for example Egyptian nationals attending the University of South Florida, Abdellatif Sherif Mohamed and Youssef Samir Megahed. They were charged last August with possessing explosive devices: 2 Charged With Pipe Bombs Near Navy Base. A well known criminal was in fact a Saudi student, namely Homaidan Al-Turki, who was pursuing a PhD in Colorado. Though not convicted as a terrorist, he was sentenced in 2006 to 20 years to life for slavery. He forced an Indonesian woman to work as a nanny in his house for years, held her passport and sexually abused her. At sentencing, al-Turki played the cultural victimization card, saying "The state has criminalized these basic Muslim behaviors. Attacking traditional Muslim behaviors was the focal point of the prosecution." So even when Saudis residing in America don't commit terrorism, many believe that they can act as they please and break American law — including the 13th Amendment to the Constitution, which ended slavery.